American culture is largely a celebration of white men’s mediocrity—that’s why Ryan Reynolds and Macklemore have any measure of success. It’s also why I haven’t been surprised by Donald Trump’s popularity. He is a self-mythologized success story of unremarkable intelligence who benefited from and subsequently exploited this country’s white supremacist racial hierarchy. He is a beacon of hope to mediocre, aggrieved white men across the nation. But at the start of this campaign season, my belief was that he was largely a distraction. Trump’s brand of racism, while vile, is not that kind that usually worries me. He says mean, hurtful things that traffic in demeaning stereotypes. It exercises no real power. The everyday maintenance of white supremacy is left in the hands of people who use less volatile language than Trump—instead, it’s in the work of voter ID laws, the extortion of fines collected through racially disproportionate traffic stops, longer prison sentences for crimes associated with racial minorities, and laws allowing police to check the immigration status of anyone they stop. I figured him for a sideshow, a reminder that we can be easily distracted from discussions around institutional racism to focus on personal bigotry. I was planning to write a piece about how Trump’s rhetoric is titillating for those who would like to pretend American racism is reducible to ignorance, while the real work of white supremacy is, and always has been, done by those who fashion themselves intellectuals, who have passed through our most celebrated educational institutions, and don’t look like the caricature we’ve built of what a racist looks like. Then he started winning. It was easy to dismiss him when his front-runner status was theoretical. But with decisive wins in New Hampshire, South Carolina, and Nevada, and strong leads in the polls for upcoming primary states, a Donald Trump presidential nomination looks more and more likely. As much as I think it’s important to divorce ourselves from the symbolism of the presidency, the thought of this frightens me, for one big reason. 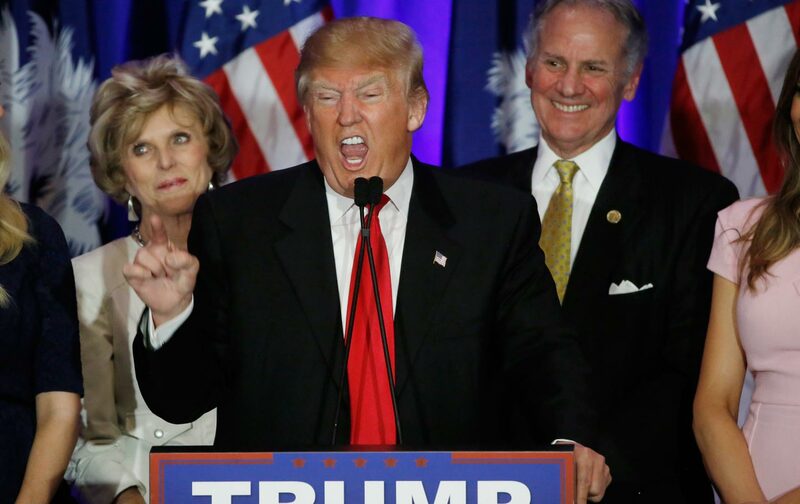 Trump’s candidacy has made explicit appeals to racism politically viable again. There isn’t a need for the coded language of the Southern Strategy that Lee Atwater masterminded. Trump shows that you can say outright exactly what you mean, no matter how appalling, and win huge support. That he can mount a campaign that advocates building a wall along the US border with Mexico, accuses the Mexican government of sending rapists to the United States, calls for a ban on Muslims coming into the country, and promotes the use of torture—and not be roundly dismissed by the electorate—is reason enough to panic. That he can do all of those things and be a major political party’s likely nominee for president in 2016 signals a regression that those invested in the American narrative of progress would probably rather ignore. Donald Trump exists as a direct response to the social movements of this moment. In five years’ time, Occupy Wall Street, the Movement for Black Lives, and Dreamers have pushed issues of inequality, police violence, immigration, and criminal justice to the forefront of American politics. Trump is a 1 percenter who threatens violence against black and brown protesters. He speaks directly to the angst of the mediocre white men whose privilege is threatened by these movements. He is the backlash. We can’t ignore that in the GOP primary race, voter turnout is up, and that has benefited Trump. He is winning a cross-section of Republican voters—“conservatives, moderates, evangelicals and those who are not born-again Christians,” according to The New York Times—but he’s turning out people who don’t believe the South should have freed the slaves after the Civil War, and who do think that the internment of Japanese people during WWII was a good idea and that desegregating the military was a bad one. Trump supporters want to fight race battles old and new. He hasn’t won them by accident. He has been more nakedly racist than any presidential candidate since David Duke (who is now encouraging his supporters to back Trump). This is the other side of progress—where the entrenched power rallies to its own defense and asserts its right to continued existence. This is the emergence of Jim Crow laws, black codes, and the convict-leasing system in the wake of Reconstruction. This is the attack on abortion rights in a post Roe v. Wade world, and on contraception and reproductive rights more generally in a post–sexual revolution world. This is the culmination of the Tea Party response to the election of Barack Obama. This could prove to be an overstatement, if Trump ultimately fails to secure the nomination. It’s not as if the other viable candidates don’t represent the same ideas as Trump. They do, but Trump’s explicit appeals on the basis of vile racist rhetoric marks a regression in American politics that even the GOP should find objectionable. Marco Rubio and Ted Cruz want to excite the same voters that Trump has, while still pretending they care about diversifying their party. Trump’s winning is throwing off the veil completely. There’s possibly some solace to be found in the fact that Trump has yet to cross the 50 percent mark in these Republican contests, but the more he wins, the stronger the support for him grows. It is saying that not only does America have contempt for people of color, the country is no longer willing to pretend that isn’t the case. Things are bad enough when we are pretending. Just how bad will it be when we don’t even want to put on the act?